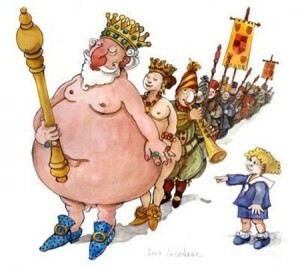 In the story of the Emperor’s New Clothes, everyone was ignoring the truth while one little boy dared to point out the obvious. I was reminded of this story recently. Potential presidential candidates are seeking to distinguish themselves from the crowd of contenders. I don’t follow politics much, but when New Jersey Governor Chris Christie spoke up about the need for reform of Social Security and Medicare recently, it grabbed my attention. I’ve just completed a grad program in which we explored the complex issues surrounding the problems threatening the Social Security and Medicare programs. Despite the serious nature of the problems, no one wants to talk about making changes. With a growing bloc of older adults and powerful special interest groups, anyone who dares to even hint at touching the programs risks political suicide. Is Christie daring to point out the emperor has no clothes? The large number of baby boomers moving into traditional retirement age means that there will be 10,000 more people eligible for Social Security every day for the next 20 years. With fewer workers in the next generation to pay into the fund, there may not be enough money to pay full benefits by 2041. And as the number of older adults nearly doubles, Medicare funding is projected to be depleted by as early as 2024. Clearly, something has to be done, and sooner would be better than later. No change means we’re headed for disaster. How to fix the problems of Social Security and Medicare is up for debate. There seems to be no clear way to resolve funding that is fair even to most people. Runaway healthcare costs and waste in reimbursement procedures complicate the matter. And the lengthening of life expectancy is making matters more serious. When Social Security started back in 1935, people were expected to live only another 14 years. In light of the 20-plus years those reaching 65 today can look forward to, Christie suggested that the eligibility age should be raised. On the surface, that seems smart. But not everyone can work longer, including those in low-paying, physically-demanding jobs. Some people have greater wealth, and he said they should collect fewer benefits since they could better afford it. But how fair is that? There are no simple answers. What is clear is that the time has come for this matter to be tackled instead of avoided. While I am no fan of Christie, I’m glad he’s dared to point out that the Social Security and Medicare programs have no clothes. Maybe we’ll garner the courage to deal with it while we still have time.